What do you do if you're a bad person - I mean, a real bully, someone who makes everyone else's life worse in pursuit of your own pleasure - and you are forced to confront that fact? That's the problem Loma Shade, a disaffected twenty-something alien on the planet Meta, is forced to grapple with when she steals a Madness Vest and jumps into the body of braindead-and-comatose Earth teenager Megan Boyer. On the outside, Megan had it all - she was beautiful, the head of the synchronized swimming team in high school, with the coolest friends and the hottest boyfriend. But as Loma wakes in Megan's body, she finds that the people around her lived in perpetual fear of Megan's vicious whims -- and have very little interest in giving her a second chance now that she has a new lease on life. Thus begins Shade the Changing Girl's first volume, "Earth Girl Made Easy," a hallucinatory but powerful look at bullying, adolescence, and escapism. Writer Cecil Castellucci is a young adult novelist who first came to DC in the late 2000s with their sadly defunct Minx line of YA-inspired comics. There, she was telling fairly grounded stories about young women with The Plain Janes and Janes in Love, two books about high school girls living life and growing up together. 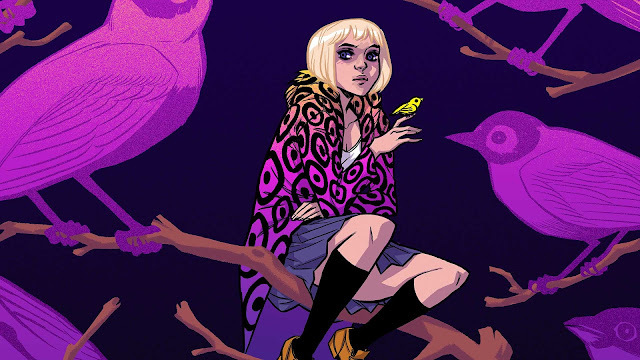 Some of those themes have carried over to Shade the Changing Girl, which is likewise about a young woman coming of age with the help of art and friendship, but Shade is a darker, weird book -- and a more ambitious one. There are a lot of different thematic threads at play in Shade, but the first volume focuses on a couple specific ones. Loma is deeply dissatisfied with her own life, where she and her friends work dead-end jobs and go from one night stand to one night stand, and she needs an escape; she finds it by manipulating a friend and lover who has the means to get away. She wants more out of a life that she feels has left her behind. But when she possesses Megan's body, she finds that she is inhabiting someone whose tendency towards manipulation and abuse has alienated everyone around her, forcing Loma to learn to take responsibility for her words and actions and make the most out of the life she has. These two ideas collide sharply with a melange of others, and Shade's rapid-fire pace means that any given issue often lays the seeds for four or five more ideas in its well-rounded cast of supporting characters. Artist Marley Zarcone and inkers Ande Parks & Ryan Kelly really bring those characters to life. Megan/Loma has an ethereal style and otherworldly body movements that constantly remind viewers that she isn't quite human and isn't quite alien, but some oddity in between. But I think where Zarcone, Parks, and Kelly really excel is in the supporting cast. We spend perilously little time with Megan's parents, but the art gives them such a deep, beaten-down sadness that you know instinctively who these people are. Much of the supporting cast, alien and human, is handled this way, given a vivid physical personality that allows our brief time with them to be packed with meaning. And don't even get me started on Megan's disembodied spirit, a creature that looks far more alien than Loma Shade ever does, a menacing pink projection that manages to be among the year's most inhuman villains. Shade also forces colorist Kelly Fitzpatrick to dig deep. Because Shade warps the world around her, in ways that range from vividly hallucinogenic to subtly emotional, Fitzpatrick's colors are often a symbol of the madness seeping into the world. Shade largely does away with comics' two dominant color palettes - 'primary colors' and 'grey' - in favor of deep purples or shades of pink and orange, polkadots and background color patterns often subtly influencing the emotions of a given scene. Fitzpatrick knows how to use color to make something simple seem disorienting and offputting, and it's a talent she uses often in Shade. This is a book largely about the power of emotion, and I think Fitzpatrick does a great job controlling that aspect of the book. When Shade the Changing Girl first began, I was a bit uncertain of it. While I appreciated the book's audacious visuals, it felt like there was an emotional disconnect. I wasn't sure what, precisely, I was supposed to hold onto. As a collected edition, however, Shade shines; the conflicts that were separated month-to-month read more comfortably back-to-back, and the relationships between the characters are much easier to see. Even in this form, I suspect the book's trippy design and tendency to shift points-of-view with little warning will be a bit offputting to some readers, but I think it's worth giving the book a shot. 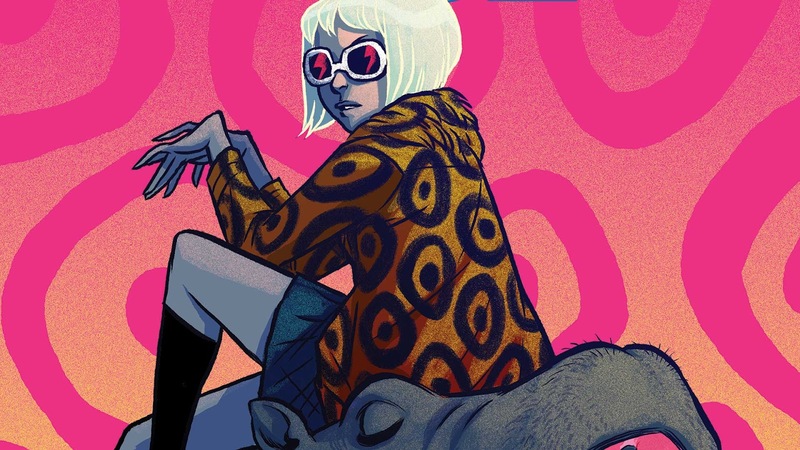 Shade the Changing Girl: Earth Girl Made Easy is, to put it simply, a phenomenal book. It's experimental without being dry, humanistic without being maudlin, and its observation of teenage girls - the harm they can do one another, and the strength of their emotions - is smart and sensitive and interesting. Castellucci found a strong emotional core for the book, and Zarcone, Parks, Kelly, Fitzpatrick, and letterer Saida Temofonte build a gorgeous framework to explore that core idea. Shade looks like nothing else DC is publishing, like nothing they've published since the Golden Age of Vertigo, and I suspect it will stand strong with some of Vertigo's most ambitious oddities. 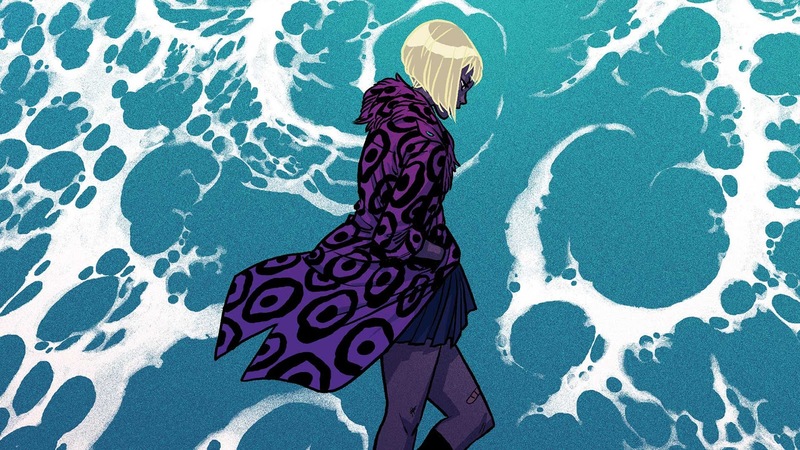 Shade the Changing Girl: Earth Girl Made Easy collects Shade the Changing Girl #1-6, and is out now in comic stores and online retailers everywhere. Shade the Changing Girl: Earth Girl Made Easy is written by Cecil Castelluci, illustrated by Marley Zarcone, inked by Ande Parks & Ryan Kelly, lettered by Saida Temofonte, and published by Young Animal, an imprint of DC Comics. The images used in this article are from Becky Cloonan's beautiful, evocative covers for the series.